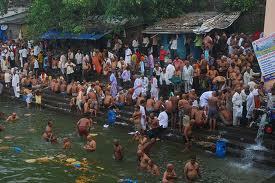 Pitru Paksha or Mahalaya Paksha, also known as Shraddh Paksha, is a fortnight dedicated to pay homage to dead ancestors. The Mahabharata has the reference story of Pitru Paksha related to King Karna and its importance. Usually, 14 days of Pitru paksha are observed in Ashwin month as per North Indian Hindi calendars whereas in Bhadrapad month as per Telugu, Kannada, Marathi, andGujarati calendars. Here is the story of Pitru paksha which is mentioned in the Mahabharata. Karna, the legendary King of the Mahabharata, donated great wealth in the form of gold, jewels, money, etc. when he was alive. He retained thousand-fold of the donated wealth once he died and reached Heaven. When he asked for food, he was served gold and jewels. Karna asked Yama the reason for the serving of gold instead of food to him. Yama told him that till he or his descendents donate food to needy people he would not get food. Karna’s sons were also died in the war. No one was there to perform food charity in his memory. Karna had never donated any food in memory of his ancestors as he was not aware of them. He prayed to Yama to send him back to earth that he will perform food charity and return back to the Heaven. Yama agreed and send Karna to earth for 14 days during which Karna fed poor and needy people. He also observed rites to his dead ancestors even he was unaware of them. Karna returned to the Heaven after 14 days and got plenty of food. These 14 days are known as Mahalaya Paksha. It is believed that offering oblations and donating food during these days would fetch salvation to performer and his dead ancestors. Pitru Paksha begins on Ashwin Krishna Pratipada and ends on Ashwin Amavasya (Mahalaya Amavasya) in North Indian Hindi calendars. The fortnight dedicated to dead ancestors starts on Bhadrapad Krishna Padyami and ends on Bhadrapada Amavasya in Marathi, Gujarati, Kannada, and Telugu calendars. Pitru Paksha 2012 starts on September 30th and ends on October 15.